Sausage, potato, and Cheddar cheese stew is a recipe you don’t want to miss. Smokey sausage, creamy potatoes, and a sharp cheddar cheese combine beautifully to serve up a delicious stew you need to try. When it comes time for fall, you know you want to change out some of the lighter meals for something more substantial that will help warm up. This soup combines smoky sausage, tender buttery potatoes, and cheddar cheese. I know you will fall in love with these just like I have. You can place this soup inside of a bread bowl if you like. 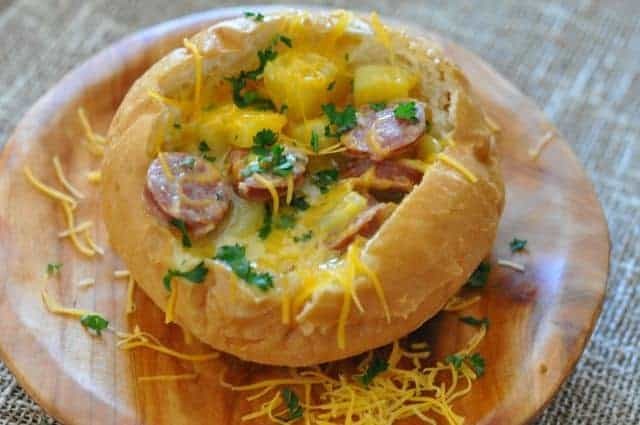 Many stores sell bread bowls so you don’t have to worry about making one for this sausage, potato, and cheese stew. This stew also tastes just as good in a bowl, so you really can enjoy it either way. This style of soup reheats very well, so if you want to bring this to lunch or even reheat it a night or two during the week you are in luck. Having a bowl of soup that you can easily reheat makes life so much easier. I sometimes cook a batch of this on the weekend just to be able to bring this to work. Who doesn’t love a crock pot recipe? We loved that this recipe was easy, and was so tasty. Yukon gold potatoes, cheddar cheese, and sausage make this soup a real delight. Our tasters really enjoyed how this was served up in a bread bowl. Filling and hearty, your guests will love this one. If you enjoyed this soup recipe I bet you will enjoy the Olive Garden Zuppa Toscana copycat soup recipe. Sausage Potato and Cheddar Cheese Stew is a hearty soup that is hard to resist. In a crock pot on high 6 hours or low 8 hours cook all ingredients except bread together, you can use a dutch oven placed in an oven on 350 for 3 hours also. When stew is done, pour into bread bowls. This was the best stew.